■ The number for the Social Security Administration is 1-800-772-1213. Never call another number provided in a phone call or email. ■ The Social Security Administration will never threaten to arrest you. ■ A Social Security number cannot be suspended. ■ Never provide your Social Security number to unknown individuals who contact you. The reason you have received this phone call from our department is to inform you that we just suspended your social security number because we found some suspicious activity. So if you want to know about this case just press 1. Thank you. Another variant is listed below that is more aggressive as they threaten to issue an arrest warrant if you do not call them back. Law enforcement agencies to suspend your Social Security number on an immediate basis, as we have received suspicious trails of information in your name. The moment you receive this message, I need you to get back to me on my department division toll-free number that is 1-888-952-5554. I repeat 1-888-952-5554. Verify the last four digits of your Social Security number when you call to better assist you with this issue. Now, if I don’t hear a call from you, we will have to issue an arrest warrant under your name and get you arrested. So, get back to me as soon as possible. Thank you. 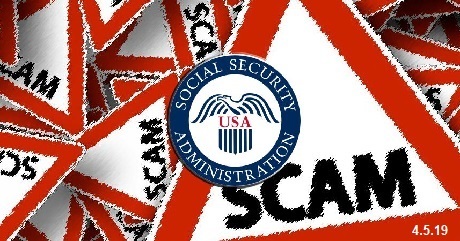 As always, be careful out there and remember that the Social Security Administration will not call and threaten to arrest you, ask for bank account information, or other sensitive information. Calls that ask for this information are scams and should be immediately hung up on.